Urban Initiatives is thrilled to announce that for the second year in a row, Optiver will be supporting our Work to Play program at National Teachers Academy (NTA). This year, Optiver increased their support of NTA by sponsoring UI’s Take the Lead program at the school as well. Although this generous support is incredibly admirable on its own, Optiver’s contributions to Urban Initiatives and the students we serve go so far above and beyond their championing a school. Optiver has supported Urban Initiatives since April of 2016, and has engaged in our work across so many different forums in the past few years. This spring they hosted the entire team from NTA at their offices. Students had the opportunity to tour the building and check out the game room and cafeteria. The highlight of the trip was when one of the software developers coded hangman on their computer for the students to play. This level of engagement goes above and beyond what is anticipated when an organization hosts our participants and our students loved their visit! Optiver was also a sponsor at all three of UI’s largest events this year. They were a Goal Sponsor at Soccer Ball, they sponsored a team at Work to Play Cup, and they sent a team out to the Corporate Challenge Cup in July. At the Corporate Challenge Cup their team played valiantly in the all traders group against some fierce competition. Optiver’s efforts on and off the field are indicative of their commitment to our students. This March, Optiver also sent out a team for Urban Initiatives’ Traders Dodgeball Tournament. Once again they played with the heart of champions. Optiver has fully dedicated themselves to engaging in our work across a spectrum of opportunities. 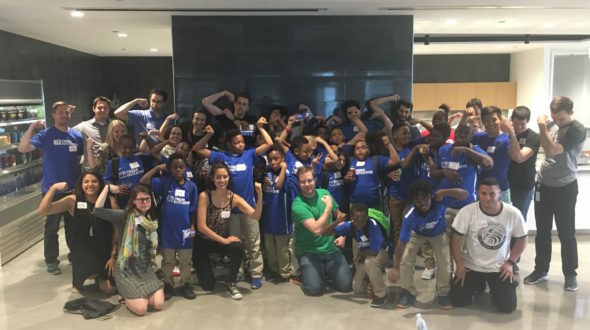 Urban Initiatives is proud to count Optiver as one of our committed corporate partners, and we can’t wait for another year of engaging Optiver’s team with our organization and students.